Problems with shed roofs usually arise when the roofing felt has come to the end of its useful life. Exposed to sun, rain and frost, roofing felt can become brittle over time, causing it to peel and crack. This lets water in which can cause problems with rust and mould. How hard is it to reroof a shed? It’s actually simple enough to repair and with the right choice of materials, a shed can be made secure and waterproof for many years. The most important element in a successful shed roof repair is the roofing felt, but performance can vary enormously. IKO Shed Felt, from roofing felt and waterproofing manufacturer IKO PLC, for example, is an economical fibre-based roofing felt finished with a fine green, red or black slate. It’s used to waterproof and protect a variety of common buildings such as sheds, summerhouses, kennels and hutches. Available in 1m x 8m and 1m x 10m rolls, this traditional roofing felt has a 5 year lifespan. 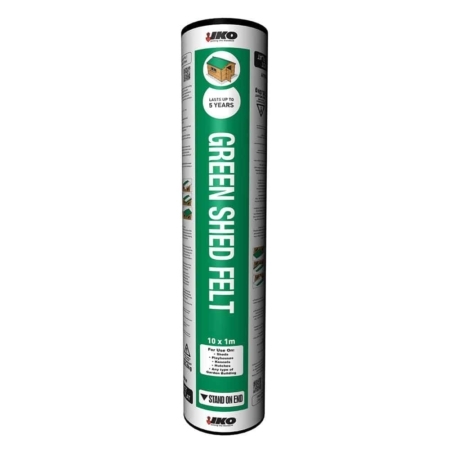 For homeowners who want a more professional look and who want to spend less time on maintenance, IKO Super Shed felt is a much longer-lasting polyester reinforced felt with a green or black mineral finish. 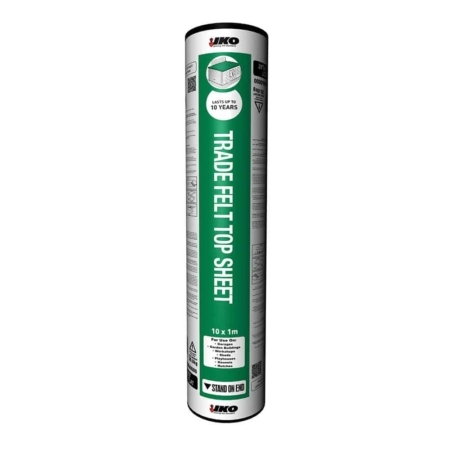 Available in the same roll sizes, it’s a robust waterproofing membrane expected to last to up to 15 years. IKO PLC has produced an easy to follow step-by-step guide, outlining the tools and materials needed to fix a shed roof and apply bituminous roofing felt.